Ryn is stranded in Denver International Airport on New Year’s Eve with one unread message on her phone. This message has been on there for a year almost to the day. It’s the last message her best friend sent her before she died in a car accident on New Year’s Day. As Ryn rushes through the airport, she bumps into Xander and they accidentally switch phones. Once they switch phones back, Ryn is thrust into one heck of an adventurous night as she meets all sorts of different kinds of strangers. Ryn is an excellent main character. Her grief and anxiety felt so real—from the constant need to have her phone at the ready to search any questions that pop into her mind to having conversations with Lottie in her head, I found this to be a very realistic portrayal. I felt for her so much and could understand the pain she was feeling. I also loved the narrative she told. Lottie and her unread message are constantly on her mind. I loved how Jessica Brody would switch back and forth from the current situation in Denver to past memories Ryn has of Lottie. I loved watching their friendship and Lottie’s character unfold. 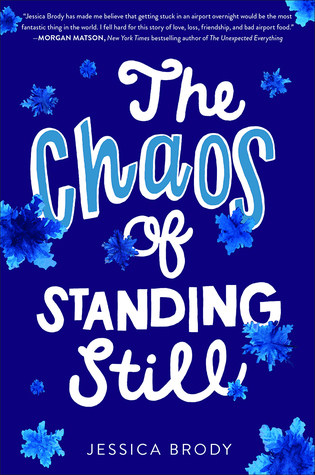 Overall, The Chaos of Standing Still is a heartwarming coming of age story about learning to move on after a tragedy and finding yourself. This is one novel not to be missed! Jessica Brody is the author of more than 17 novels for teens, tweens, and adults including The Chaos of Standing Still, In Some Other Life, Addie Bell’s Shortcut to Growing Up, A Week of Mondays, 52 Reasons to Hate My Father, the forthcoming Better You Than Me (Fall 2018) and the three books in the sci-fi Unremembered trilogy. She’s also the author of the Descendants: School of Secrets series, based on the hit Disney Channel original movie, Descendants. Additionally, Jessica’s first non-fiction book, Save the Cat! Writes a Novel (a plotting guide for novelists) will release in Fall of 2018. Jessica’s books have been translated and published in over 23 countries and Unremembered and 52 Reasons to Hate My Father are currently in development as major motion pictures. She lives with her husband and four dogs and splits her time between California and Colorado. It was very different than what I was expecting, but it was still so good! I hope you enjoy it if you read it!